That cozy weather time of year also tends to mean that "sick" time of year. And if you didn't know, I'm kind of a freak about taking any over the counter or prescription medicines unless it's absolutely necessary. So natural, healing foods and drinks (and supplements) are my thing. All of these good-for-you things are hiding in the bones that we usually toss away. I used to do the same! 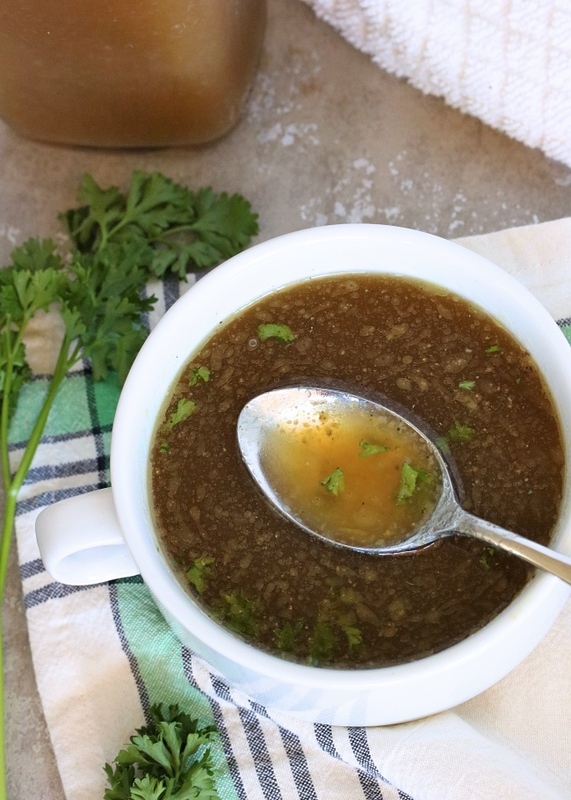 But now that I've learned just how easy it is to making a healing broth using those "scraps"- you can bet I'll be hoarding them ALL in my freezer! My favorite way to stockpile is as I cook. Making my Whole Roasted Chicken with Vegetables? Toss that chicken carcass in a freezer-friendly bag and save it for your broth. Same goes for the veggie scraps you probably toss all the time (if you're anything like I was): the ends of onions, carrot & celery roots, or green onions you won't use before they go bad. Hang on to those in the freezer until you're ready to make your broth- it's an easy & cost efficient way to make the most delicious broth! 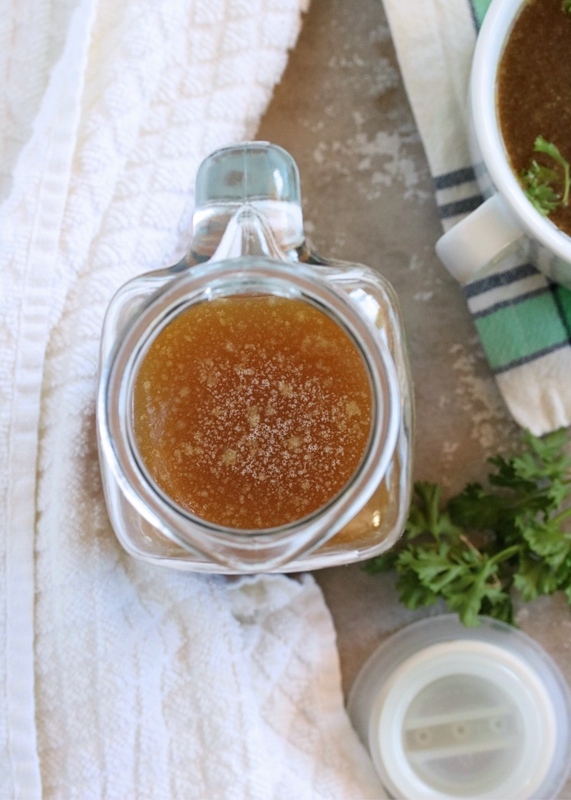 Once your broth is made, you might be looking for ways to use it up. Try it in soups, stews, chilis, and sauces: in place of any other broth, or diluted with a little water to make it stretch further. 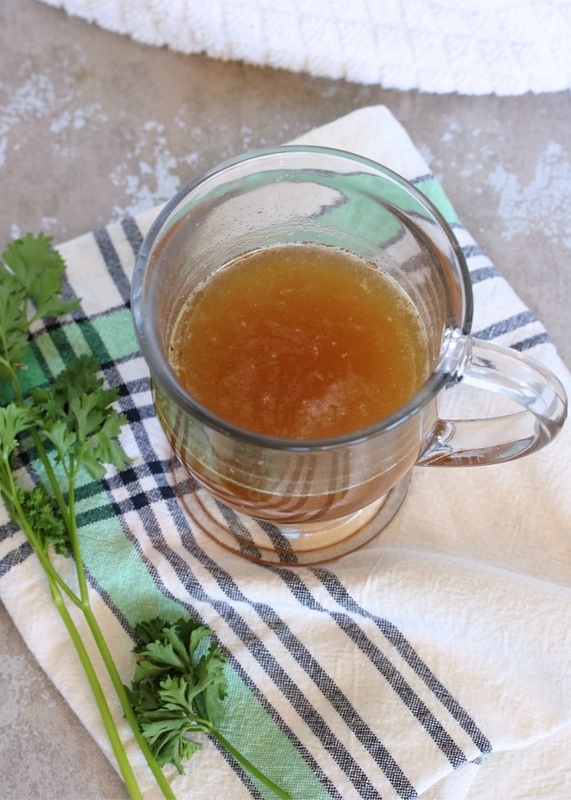 My favorite way to get in my bone broth? As a sipping broth. Instead another cup of coffee or tea, or even as an "afternoon snack". I add some garlic powder, salt, & pepper, and sometimes a touch of ghee. Warm it up and enjoy! Other great additions to your sipping broth: sliced green onion, fresh ginger, turmeric root, and avocado. 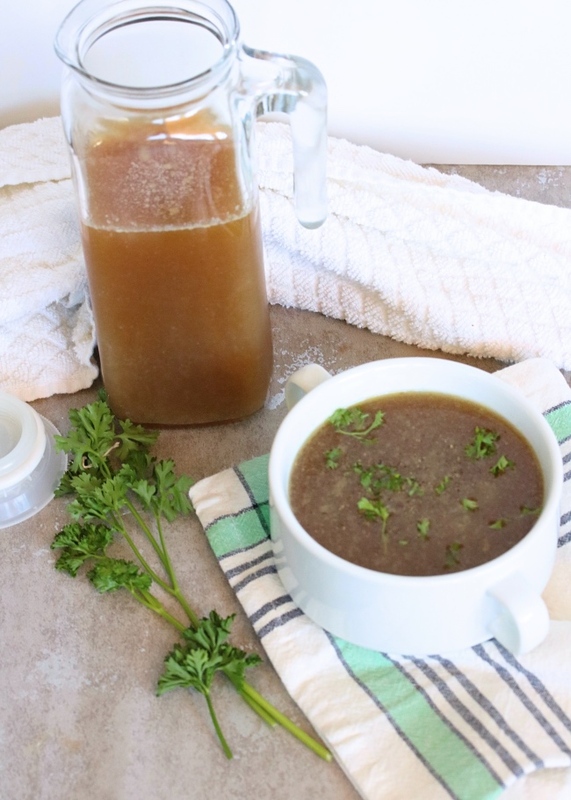 *NOTE: I have had so many of you message me about how healing bone broth has been for your dogs! Such a great idea if your pup is experiencing digestive issues or join pain- and tastes good too, so I'm sure they won't complain! 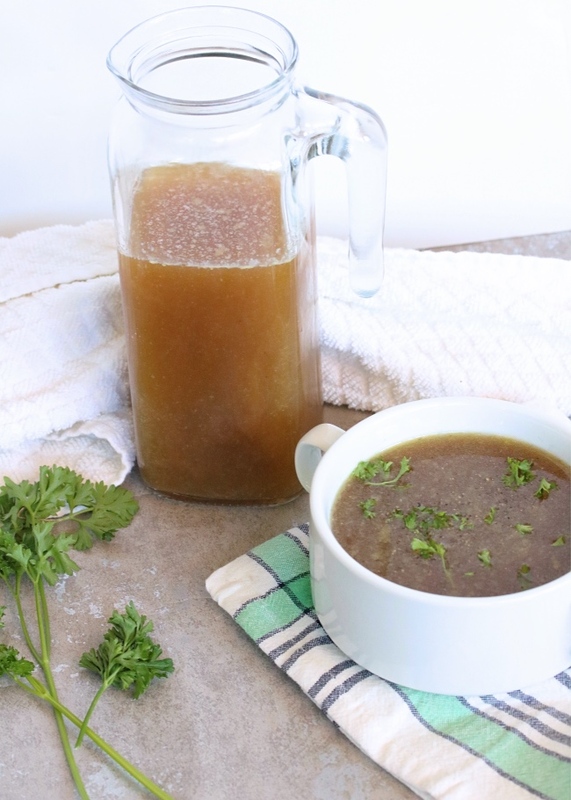 So now we get started- with an easy method to make your nutrient dense broth: in the slow cooker! Simmering on a gas stove overnight with no one to watch the flame makes me very nervous- what if that flame goes out & gas is pouring into our house all night? I'm a worrier, I guess. The slow cooker makes me most comfortable since I want this broth to simmer for at least 24 hours. You can do less, but the longer you go- the more nutrients you extract from those bones & the more flavor you render. Add the ingredients to a slow cooker and cover with enough filtered water to cover. Set the slow cooker to "low" and cook for 24 hours. You can do as little as 10, or as long as 36- the longer the better in my book unless you don't want it too dark. 24 hours is the sweet spot for us! Stir the broth occasionally (every few hours or so) to keep from burning. Strain the broth in a mesh strainer over a large bowl. Cool the broth, and store refrigerated. Use within 4-5 days, and freeze any that won't be used within that time frame. This is my go-to ratio of ingredients, but feel free to use it as a loose guide and change things up depending on what you have. If you notice your broth thickening into an almost "gel" consistency when cooled- you had some awesome bones to work with! 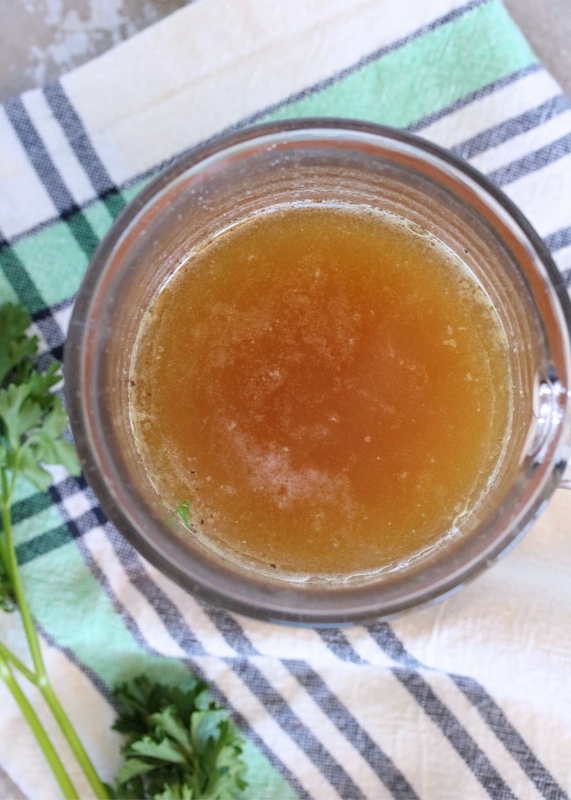 That's a great sign of an ultra-nutrient-rich bone broth. Once cooled, you can freeze the broth in freezer cubes (I like the large ones that give me about a portion size) or even mason jars! Note on freezing in glass- make sure you let the broth cool before transferring to a jar. Also leave room for it to expand- a couple inches from the top of the jar. To avoid broken glass!